That said, not every phone value depreciates the same, we tracked the trade-in prices hourly for 12 months so we can analyze when smartphone prices drop and find which phones are 2018’s biggest winners and losers. Use the links below to jump to navigate the pricing analysis or jump straight to the bottom where we have over 100 phones depreciation values for 2018. Simply filter by brand, model, release date and depreciation rate to find this year’s biggest winners and losers. Galaxy S Phones Might be the Worst Investment! The Samsung Galaxy S9 released in March 2018 for $720. Almost 60% of its value vanished in nine months, being one of the fastest depreciating handsets ending the year, worth $290. Additionally, out of all the phones, in only nine months the S9 was ranked third for losing the most physical money out of all devices, followed by the S9 Plus in fourth. In fact, the S9 lost 41.66% of its value in month one. If the S10 follows the same depreciation pattern as its predecessors, it is set to lose almost half its value in the first month of release. On a percentage basis, the Galaxy S9 depreciated almost twice as fast as the iPhone X from its original release price. As smartphones become more expensive, consumers need to be aware of these trends if they plan to use their old device as upgrade collateral. Brand new iPhones always get listed at a low price, this is due to trade-in stores looking to maximize profits when people keep their old phone and look to cash in the new one. The new iPhone XS/XR range AND the iPhone X/8 saw trade-in price increases as we entered 2019. This reaffirms that the 3 months following the keynote is a trade-in black hole that consumers should avoid. Customers that take advantage of trade-in stores 30-day price lock could have earned $100+ more selling an iPhone X before the event. Consumers should be aware that there is no obligation to send their device in, essentially they can lock the price and decide if they want the new phone after its announcement event. The iPhones releases were the only that had a drastic impact on depreciation, typically most other Android devices see a small drop. For example, when tracking the 2015-2017 Galaxy S6-S8 models, most only saw drops of 5-13% in weeks following the March Galaxy S9 release. How much does an iPhone depreciate each year? The table below shows how the yearly release cycle is the driving factor in your iPhone’s trade in depreciation; this data demonstrates the devaluation of iPhone’s purchased in 2016-17. As you can see, if you’re planning on upgrading to a new model and you finally paid off your old one, the headlines about selling your iPhone before the yearly release is not a statement to take lightly. *Figures shown are averages from all storage sizes for each device, see here for storage capacity specific depreciation. 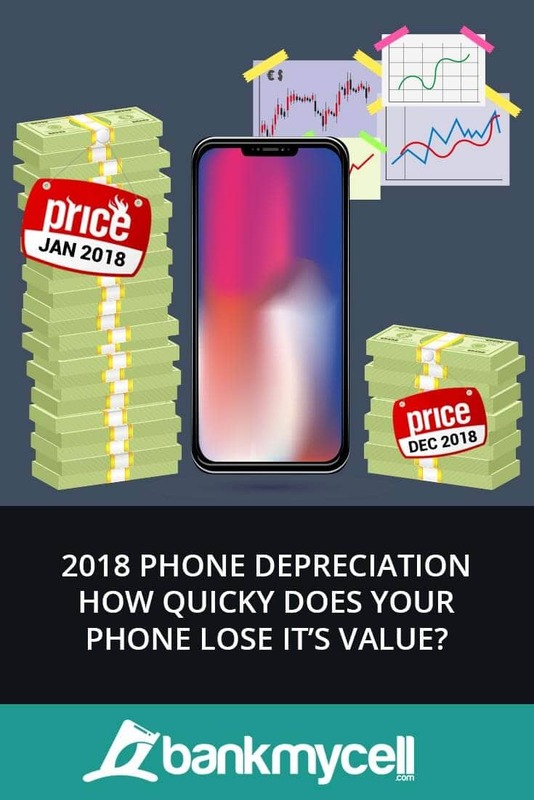 **Depreciation figures are from the first resale price listed in 2018, not the phones brand new price. Following the standard September release pattern of Apple, new iPhones see a hard-hitting dip in value from their original resale value in the first few months, then stabilize as they enter the following year – this stabilization is seen in the previous chart above. In the case of this year’s iPhone releases, we ignored September pricing for the XS as they remained the same until October, then began to decline. Again, the new iPhone keynote and releases triggered an overwhelming loss in value for last year’s iPhone 8, 8 Plus and X models. In fact, 78.89% of the iPhone 8’s total depreciation this year happened in just over 3 months following the announcement of the XS/XR models. Likewise, 69.37 of the iPhone 8 Plus and 69.99% of the iPhone X happened in the same period. Breaking the normal release date pattern, the iPhone SE launched in March 2016, however, the iPhone 7/Plus came in September 2016 as usual. As you can see the decline of in value from year start to finish is much the same, however, the monthly decline curve is much steadier. A lower figure of 53.39% of the total year’s iPhone 7 depreciation happened over 3 months following the announcement of the XS/XR models, 59.58% for the iPhone 8 Plus – both are still much lower than 2017’s iPhone 8 losing 78.89%. The iPhone 6S/Plus was released in September 2015, the data shows that even devices 3 years old can be impacted by the new releases in a big way. In this case, the more expensive 6S Plus model lost 60.82% of its total depreciation in 2018 from the XS announcement onwards – The iPhone 6S only lost 37.17% of its total. You would think the value of the latest phones packed full of cutting-edge power and features would be safe for a year or so, you’d be wrong. In less than nine months the Samsung Galaxy S9 and S9+ models have lost up to 35.07% of their resale value. Furthermore, when you look at the brand new price in March (S9: $720 / S9+: $840) these phones are now worth 59% less than what the consumer paid for them. That’s some crazy smartphone depreciation right there! The release of the Samsung Galaxy S9 this year impacted the value of the Galaxy S8 the most, losing half of the total smartphone depreciation in the year in the first 4 months, similar to the iPhones. The Samsung Galaxy S7 pricing has been much more volatile, losing value initially during the months after the release then recovering to its initial year start value through in June. The values of the Galaxy S6 and S6 Edge showed real volatility following the S9 announcement, instantly dropping the resale value by half of its total depreciation in the year. This sharp spike trend was however short-lived, much like the S7 in the previous chart, all 3 devices showed signs of recovering their worth 2-3 months following the S9 launch. The table below shows the cell phones that lost the largest amount of value by percentage between January and December 2018. The majority of the devices are several years old so it’s no wonder the demand is wavering as they become vastly outdated. The LG G6, however, was released the year before (March 2017) and lost just under half worth, starting at $220 it declined to $110 in 2018. Samsung Galaxy S9 and S9+ were the only handsets released in 2018 that saw their value plummet, as smartphones get increasingly more expensive, it begs the question; Are the latest Samsung Galaxy S devices worth investing in if you upgrade every year? The wrath of the new iPhone XS / XS Max / XR releases had enough impact to leave the iPhone X depreciating by $190. As mentioned in the iPhone specific depreciation part of this study, 26.29% of the total 38.46% yearly depreciation of the iPhone X 256GB was seen in Oct-Dec 2018 following the iPhone event. It’s also worth noting that now the trade-in market isn’t as saturated by iPhone X models, the value at the end of February 2019 has actually increased by $50, signifying just how important it is to not sell during Q4 following the announcements. Click and sort the columns on the data table below to check out the price trends by brand, starting price, release date and most importantly depreciation. Depreciation is measured by a percentage decrease calculation of those figures.